MT13GXG SEAT LEON 1.6 TDI SE 5d 105 BHP- 58k miles . The SE model looks stunning in RED and boasts a spec of 16" alloy wheels, cruise control,DAB radio, air conditioning, bluetooth,, multi functioning steering wheel, electric windows and remote central locking. The 1.6TDi is free to tax for the year due to its extremely low emissions meaning it is incredibly economical with Seat fuel consumption figures showing 85mpg extra urban and 74mpg combined. Superb value for money at this price! 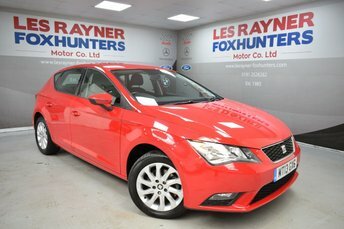 Find your next dream car with the help of the experienced team at Les Rayner Foxhunters Motor Company Ltd. We're proud to stock an excellent selection of used SEAT cars, with models to suit a wide range of motorists. Take to the city in a used SEAT Mii, enjoy the punchy engine of a used SEAT Ibiza Cupra, or discover more about the practical nature and spacious interior of the SEAT Alhambra. Browse the full range of used SEAT models for sale in Whitley Bay here on the website, and feel free to contact a member of the showroom team for more information. Rest assured that we'll always go the extra mile to ensure you find the right used car to suit your lifestyle and budget. Finance is available to UK residents aged 18 years or older, subject to status. Terms & Conditions apply. Indemnities may be required. Other finance offers may be available but cannot be used in conjunction with this offer. We work with a number of carefully selected credit providers who may be able to offer you finance for your purchase, commission may be received. We are only able to offer finance products from these providers. Postal Address: Les Rayner Foxhunters Motor Company Ltd, Foxhunters Road, Whitley Bay, Tyne and Wear NE25 8UG. Find contact details here. Les Rayner Foxhunters Motor Company. Ltd., trading as Les Rayner Foxhunters Motor Co. Ltd. is a Company registered in England and Wales under company registration number 02848040. Our Registered Address is Foxhunters Road, Whitley Bay, Tyne & Wear, NE25 8UG, telephone 0191 2528282. Les Rayner Foxhunters Motor Co. Ltd. is authorised and regulated by the Financial Conduct Authority in regard to Consumer Credit, our firm reference number is 653636. Les Rayner Foxhunters Motor Company Ltd, trading as Les Rayner Foxhunters Motor Co. Ltd. are a credit broker, not a lender. We can introduce you to a limited number of finance providers which we have selected carefully, and who may pay us for introducing you to them. Les Rayner Foxhunters Motor Company Ltd, trading as Les Rayner Foxhunters Motor Company Ltd Motor Group is an Appointed Representative of Autoprotect MBI Ltd for insurance mediation purposes. Autoprotect MBI Ltd is authorised and regulated by the Financial Conduct Authority, their firm reference number is 313486. Les Rayner Foxhunters Motor Company. Ltd., trading as Les Rayner Foxhunters Motor Co. Ltd. is registered with the information commission office in relation to the storage and use of personal and sensitive data.